(Nanowerk News) Researchers have designed a nanoparticle transport system for gene delivery that destroys deadly brain gliomas in a rat model, significantly extending the lives of the treated animals. The nanoparticles are filled with genes for an enzyme that converts a prodrug called ganciclovir into a potent destroyer of the glioma cells. Glioma is one of the most lethal human cancers, with a five year survival rate of just 12%, and no reliable treatment. Advances in the understanding of the molecular processes that cause these tumors has resulted in therapies aimed at delivering specific genes into tumors – genes that make proteins to kill or suppress the growth of the tumor. Currently this approach relies heavily on using viruses to deliver the anti-tumor genes into the target cancer cells. Unfortunately, viral delivery poses significant safety risks including toxicity, activation of the patient’s immune system against the virus, and the possibility of the virus itself encouraging tumors to develop. Scheme for nanoparticle gene therapy. 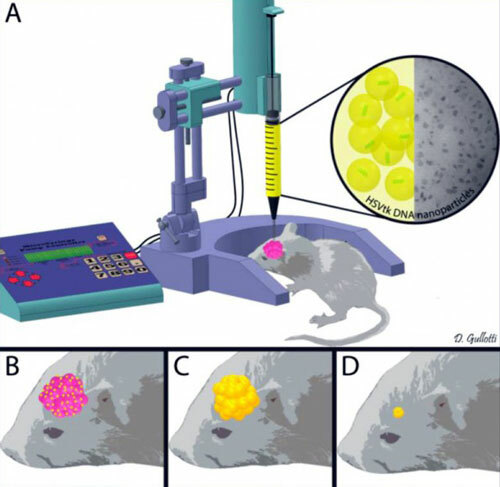 A.Nanoparticles carrying DNA encoding HSVtk are injected into rat gliomas B. Convection-enhanced delivery (CED) pressure during injection distributes nanoparticles (yellow dots) throughout the tumor (pink) C. The nanoparticles make thymidine kinase, which is spread throughout the tumor (yellow) D. Ganciclovir, delivered into the rat’s blood system, reacts with the thymidine kinase to kill and shrink the tumor. Jordan Green, Ph.D., of the Johns Hopkins University School of Medicine Biomedical Engineering Department and a senior author of the work, and his international team describe their findings in the February 24 issue of ACS Nano ("Polymeric Nanoparticles for Nonviral Gene Therapy Extend Brain Tumor Survival in Vivo"). The collaborators include colleagues from the Johns Hopkins University School of Medicine Departments of Neurosurgery, Oncology, Ophthalmology, and Pathology, as well as Tang Du Hospital in China, University of the Negevin, Israel, and the Instituto Neurologico C. Besta in Italy. Biodegradable nanoparticles have recently shown promise as a method to deliver genes into cells. Their use for delivery avoids many of the problems associated with viral gene delivery. To demonstrate virus free delivery, the first goal of the group was to develop a nanoparticle that could efficiently carry DNA encoding a gene known as HSVtk into cells. The HSVtk gene produces an enzyme that turns the compound ganciclovir--which by itself has no effect on cancer cells -- into a compound that is toxic to actively dividing brain cancer cells. A number of polymer structures were tested for their ability to deliver DNA into two rat glioma cell lines. Among the many polymers tried, the one known as PBAE 447 was found to be the most efficient in delivering the HSVtk gene into the cultured rat glioma cells. Furthermore, when combined with ganciclovir, the HSVtk-encoding nanoparticles were 100% effective in killing both of the glioma cell lines grown in the laboratory. Next, the gene therapy system was tested in live rats with brain gliomas. Because it is important that the nanoparticles spread throughout the entire tumor, they were infused into the rat gliomas using convection-enhanced delivery (CED). The method involves injection into the tumor and the application of a pressure gradient, which efficiently disperses the nanoparticles throughout the tumors. To test the tumor-killing ability of the system, the tumor-bearing rats were given systemic administration of ganciclovir for two days, then CED was used to infuse the HSVtk-encoding nanoparticles into the rat gliomas, and systemic ganciclovir treatment continued for eight more days. The treatment resulted in shrinkage of the tumors and a significant increase in survival when compared with control glioma-bearing animals that did not receive the combination treatment. In the future, the investigators envision that doctors would administer this therapy during the surgery commonly used to treat glioma in humans. They are also interested in testing the ability to deliver other cancer-killing genes and whether the nanoparticles could be successfully administered systemically -- which could broaden the use of the therapy for a wide range of solid tumors and systemic cancers.